Awaiting the US Supreme Court’s consideration of certiorari petition and consideration of related petition in Rowan County v. Lund. Is legislative prayer on its way back to the Supreme Court? Bormuth v. County of Jackson, Michigan. The Becket Fund for Religious Liberty (n.d.). Retrieved from https://www.becketlaw.org/case/bormuth-v-county-jackson-michigan/. Bormuth v. County of Jackson, Michigan. (Apr. 04, 2019). https://www.becketlaw.org/case/bormuth-v-county-jackson-michigan/. "Bormuth v. County of Jackson, Michigan." The Becket Fund for Religious Liberty. Accessed [Apr. 04, 2019]. https://www.becketlaw.org/case/bormuth-v-county-jackson-michigan/. In the Bormuth v. County of Jackson case, Pagan activist Peter Bormuth tried to stop small-town county commissioners from continuing their tradition of voluntary prayer before their meetings. The full Sixth Circuit Court of Appeals heard the case June 14, 2017 and rejected Bormuth’s crusade on September 6, 2017. The court’s ruling directly conflicts with another full federal appellate court’s recent ruling, likely setting up a showdown at the U.S. Supreme Court. In May 2017, Becket teamed up with leading religious liberty scholar and Stanford Law School Professor Michael McConnell to file a friend-of-the-court brief in the Sixth Circuit. 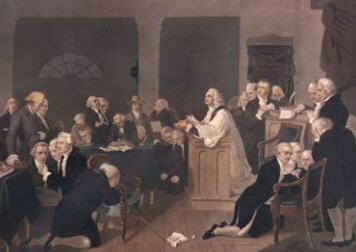 Becket’s brief points out that the Founding Fathers would never have viewed legislator-led legislative prayer as creating an official state church, which the First Amendment prohibits. This case is about answering the question “what is an establishment of religion?” The job of the First Amendment’s Establishment Clause is to prevent the government from establishing a state church, but determining what establishes a state church has been notoriously difficult for courts. In 1971, the Supreme Court created a three-part test that attempted to answer that question in the notorious Lemon v. Kurtzman case. The Lemon test was immediately a disaster. Its malleable approach ignored what the Founders considered to be an establishment of religion, invited anti-religious activists to file lawsuits against anything that looked vaguely religious, and led to unpredictable outcomes. Justice Scalia famously compared the Lemon test to a zombie that frightened small-town America with arbitrary rulings and massive attorneys’ fees. Lemon’s reign toppled memorials to police officers, ended services to prisoners, and censored historic landmarks. Three years ago, the Supreme Court finally put Lemon in its grave. In its Town of Greece v. Galloway ruling, the Court replaced Lemon’s subjective test with a command that any Establishment Clause test must start with an objective evaluation of our nation’s history. Town of Greece said that because legislative prayer was nothing like what the Founders considered to be an establishment of religion, and in fact was something the Founders approved and practiced, it didn’t violate the Establishment Clause. Bormuth tried to resurrect the Lemon test and ignore the Town of Greece ruling in two ways: his arguments ignored the history that legislators have opened meetings with prayer since before the founding of the country, and it ignored that Town of Greece explicitly protected legislative prayer. The full Sixth Circuit rejected both elements of Bormuth’s gambit—following Town of Greece, it ignored Lemon and took history seriously. And because the Sixth Circuit follows Town of Greece, its ruling directly conflicts with another legislative prayer case, Lund v. Rowan County, recently decided by the entire Fourth Circuit Court of Appeals. On January 5, 2018 Bormuth petitioned the Supreme Court to hear his case. Since there is strong disagreement between the Fourth and Sixth Circuits on this important church-state conflict the Supreme will likely wade back into an issue settled in Town of Greece. The County of Jackson is represented by First Liberty.